Optional De-rotation Strap hooks to the UltraSling III and prevents internal rotation by securely holding the patient's arm in neutral position. I have the ultrasonic lll, I received it after having surgery last year. It needed to be washed so I hand washed it. Well, it hasn't fit right since. I never received instructions. Could you please email those to me? Maybe I didn't put it back together properly. Thank you. 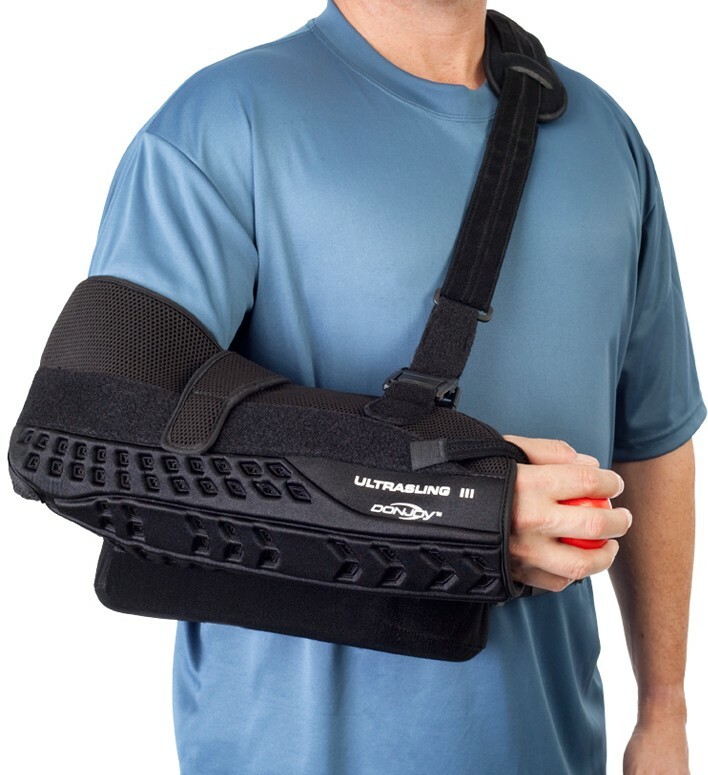 Is this ultrasling III able to be put on either arm? The Ultrasling is universal. Although the Ultra-sling ER is made either right or left arm. My wife has just fractured her elbow. Previously when I have had issues with my arm, I had to take the sling off. With the UltraSling III, should she take it off for bed? Thanks in advance. Thank you for your question. Generally with the UltraSling it is suggested you sleep with the sling on. However, you may want to check with your doctor to verify what he/she would like your wife to do. Will you please email a copy of correct positioning instructions for the Ultrasling III. I had surgery on Tuesday and the instructions were not given back to me from the surgical center. An email has been sent to you with instructions for the UltraSling III. Please let us know if you have any more questions. The UltraSling III comes with instructions did you not recieve them? If not, please call Product Support at 888-405-3251 to send you a copy. What is the weight of the Ultrasling III? The Donjoy Ultrasling III is no more than 1lb. depending on the size the weight varies but it's a relatively light weight product. How do I wash the ultrasling III? You may hand wash, and air dry the ultrasling III. pleased with my purchase. The black fabric was cool in the summer heat. This sling is much more comfortable and stable than a standard sling. I had rotator cuff surgery and this sling is comfortable even when I'm sleeping. Comfortable, mesh material does provide coolness rather than the other sling I was wearing; would recommend especially in long term bracing.